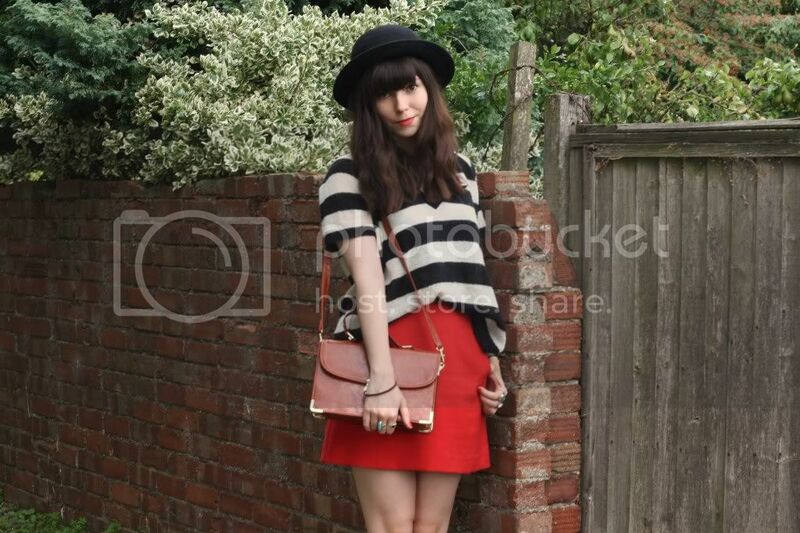 i'd considered wearing my leather shorts with this jumper instead of the red skirt. i felt as though the red was too much of a clash with the stripes, but as soon as i put the outfit on i loved how it looked! so much for my idea of only wearing pastels and floaty things this summer, ha. i love how this jumper is cut like a t-shirt, with the short sleeves and v-neck. it's so big, and made of that kind of wool that is really itchy, but i love how vibrant it is and i can't wait to wear it in autumn! The lipstick red skirt is a beautiful hue on you! And adore the silhouette of the jumper. I really, really adore your jumper! 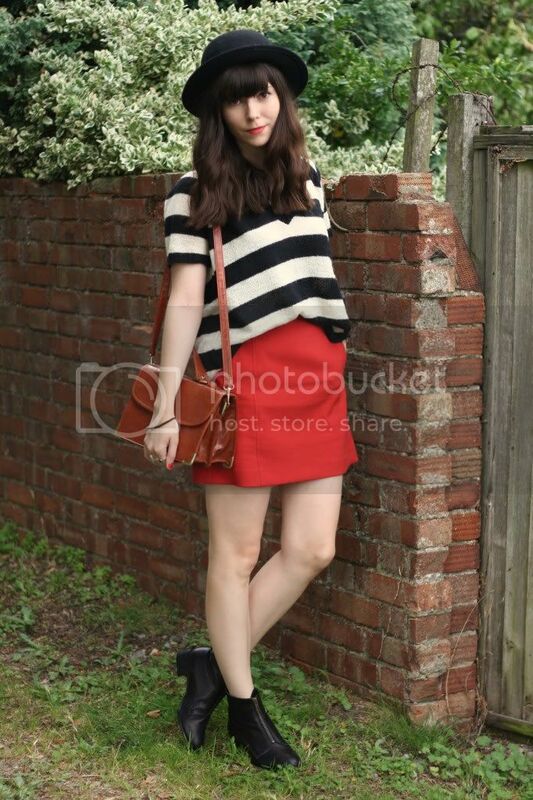 This look is so mod, I'm adoring the stipes with your red skirt. And the hat's perfect, as usual! 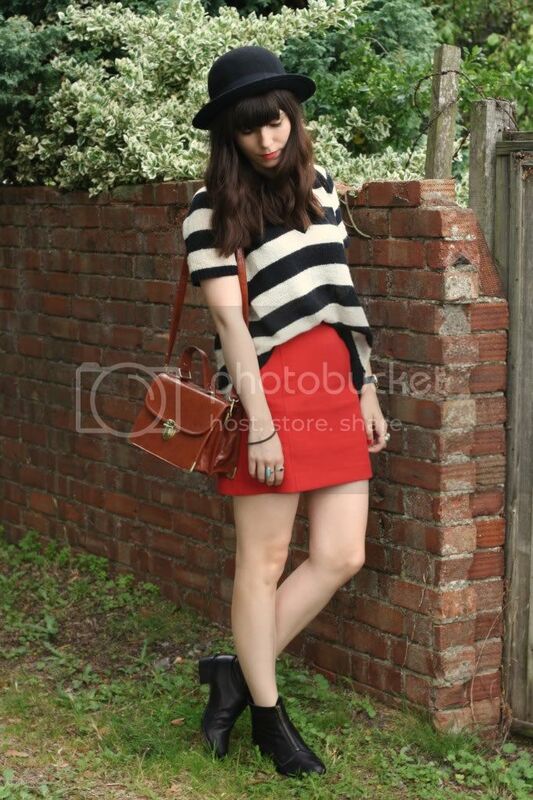 Red and stripes go perfectly together :) LOVEE this outfit! i too am anxious for fall to arrive! i am so excited to finally wear my sweaters and hats and scarves again. i love your stripes and your red lips! adorable! i love that striped top it looks so cozy! I love your blog, a lot! This is so perfectly cute! That bag is amazing! Ooh I love the red too....there's a real feistyiess to this outfit! Another lovely outfit :) I really enjoy your style. Check out my blog on the Kimono style from my Autumn/Winter collection! I would love to know what you think! great combo, as per usual! giveaway on my blog, it ends tomorrow! That sweater is so great! Even if it's itchy...it looks so good. 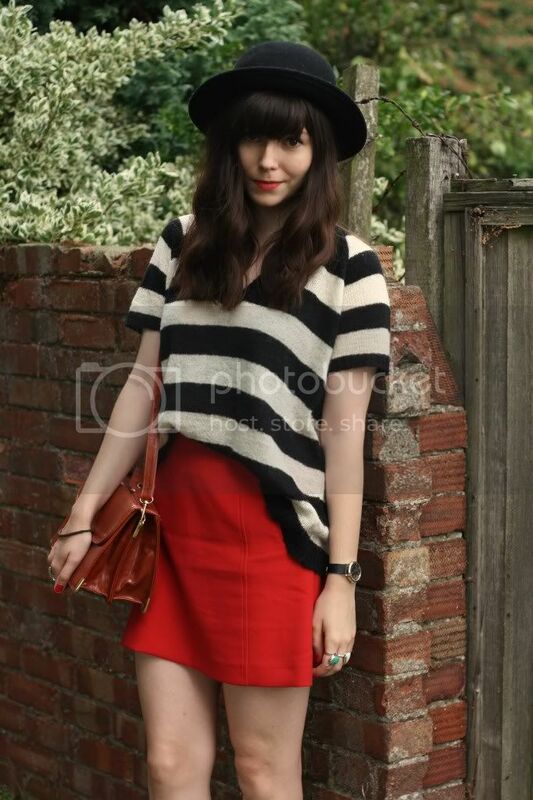 And b&w stripes always look fabulous with red! Love! Everything just works so well together!